The Navajo Nation and associated left-wing activist groups won this battle in 2017, essentially giving the Navajo Nation majority control over the county, despite the fact that the Navajo reservation comprises only one-tenth of the county’s landmass. Two recently-elected commissioners in San Juan County, Utah, are preparing resolutions that, if enacted, would undo the will of locals in matters related to the unpopular national monument that was revised by President Trump in December of 2017. The newly-elected commissioners, Kenneth Maryboy and Willie Grayeyes are both activists associated with the radical environmentalist groups, Dine’ Bikeyah, Southern Utah Wilderness Alliance, and Friends of Cedar Mesa. The new commissioners are members of the Navajo Nation and are also Democrats, leaving veteran Republican commissioner, Bruce Adams, in the minority. The population of San Juan County, in contrast, is rural with an agricultural and mining economic base and majority of conservative-leaning voters. But the election of Maryboy and Grayeyes was made possible by the recent race-based redrawing of districts in 2017. As a result, this mostly-Republican county has a Democrat-dominated county commission. The controversy dogging Grayeyes doesn’t end with the race-based gerrymandering that resulted from a lawsuit against the county. An Arizona resident with his driver’s license, post office box, and a home in Page, Grayeyes has claimed the right to run for public office in San Juan County (SJC) due to the fact that his umbilical cord is buried somewhere in Piute Mesa, just north of the Arizona border. His questionable residency is the subject of an ongoing legal battle. SJC locals have expressed concerns that the new Democrat county commission will not be representing their interests, but will be forcing liberal policies into county government, and doing the bidding of radical environmental groups. Draft resolutions obtained by Free Range Report, hint strongly that those concerns about the new SJC commission may be warranted. RESOLUTION DIRECTING THAT REGULAR MEETINGS OF THE SAN JUAN COUNTY COMMISSION BE HELD IN LOCATIONS IN THE SOUTHERN PORTION OF THE COUNTY AND SETTING A SCHEDULE FOR SUCH MEETINGS. 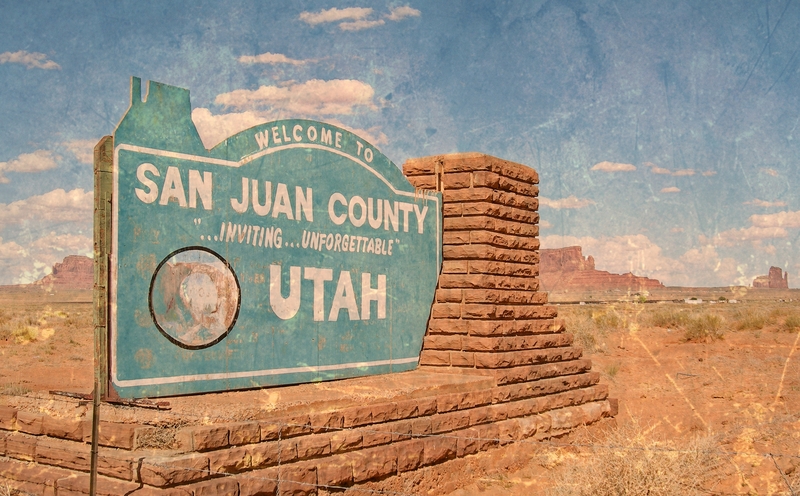 WHEREAS, San Juan County is one of the largest counties in the United States and its citizens often live far from the County seat in Monticello, Utah. For example, citizens living in Navajo Mountain, Utah, must drive nearly four hours to get to Monticello. WHEREAS, in light of the size of the County and the requests of communities in the southern part of the County, the San Juan County Commission believes the public business requires that its meetings occasionally be held in locations around the southern part of the County. Section 1: The regular meeting of the San Juan County Commission on the third Tuesday of February, April, June, August, October and December 2019, shall be held at different locations in the southern part of the County. Section 2: The County Administrator shall immediately contact the chapter managers of the Navajo Mountain, Oljato, Mexican Water and Aneth chapters, as well as the Town of Bluff, to make arrangements to hold the Commission meeting on the third Tuesday of every even­ numbered month on a rotating basis at each one of the chapter houses (or in the case of Oljato, at the Monument Valley Visitor Center) and at the Bluff Community Center, The County Administrator shall also make arrangements for Navajo interpretation at those locations. Section 3: The first such meeting shall be held on the third Tuesday in February 2019. The County Administrator shall report to the Commission at its regular meeting on the first Tuesday in February 2019 on the arrangements he has made for these meetings. Although the population of SJC is spread out from Spanish Valley, just south of Moab, to the Arizona and Colorado borders, this resolution focuses primarily on the Navajo reservation and Bluff, both Democrat strongholds in the far southern corner of the county. Those communities to the north are not given consideration. The next questionable resolution (see below) appears to be in response to previous cases in which SJC has sought attorneys from outside the county to represent it in complex and controversial cases. In one such case, the Navajo Nation has litigated against SJC for years over voter districts. Defending against the lawsuits has been extremely costly to the county, which hired a legal team from Salt Lake City. The Navajo Nation and associated left-wing activist groups won this battle in 2017, essentially giving the Navajo Nation majority control over the county, despite the fact that the Navajo reservation comprises only one-tenth of the county’s landmass. RESOLUTION DIRECTING THE SAN JUAN COUNTY ATTORNEY, KENDALL LAWS, TO IMMEDIATELY PREPARE A COMPREHENSIVE INVENTORY OF ALL CIVIL LITIGATION IN WHICH THE COUNTY IS A PARTY. WHEREAS, San Juan County is a party in various civil cases. WHEREAS, the San Juan County Commission has sole authority to choose the legal options to be pursued by the County as expressed though official actions of the Commission. WHEREAS, as is true of any client, the County, through its Commission, needs to be fully informed of the legal issues facing the County. The Commission has two new members who need to understand the status of civil litigation in which the County is a party. WHEREAS, the San Juan County Attorney, Kendall Laws, is required to implement the directives of his client, San Juan County, as those directives are expressed in official actions of the County Commission. See, Salt Lake County Commission v Salt lake County Attorney, 985 P.2d 899, 905 (1999); UCA § 17-18a-802; Rules 1 2 and 1.13, Utah Rules of Professional Conduct. WHEREAS, the County, through this officia1 action of the San Juan County Commission, intends to exercise its sole authority to choose the legal options pursued by the County by directing the County Attorney to provide a comprehensive inventory of all civil litigation in which the County is a party. Section 1: The County Attorney is directed to immediately prepare a comprehensive inventory of all civil litigation to which the County is a party This inventory shall include, for each case, the case name, case number, court in which the case is filed and a summary of the current status of the case. The inventory shall also include any key pleadings in the case and, if the case is being handled by outside legal counsel, a copy of the representation agreement between the outside counsel and the County and copies of all invoices for worked performed by such counsel from January 2018 through the present date. Section 2: The County Attorney is to prepare and transmit the litigation inventory to the Commission by not later than January 25, 2019. Section 3: If the County Attorney is unwilling to comply with the directives contained in this Resolution, he is further directed to submit a letter or memorandum to the Commission stating his refusal and the grounds for his refusal by not later than January 18, 2019 . Another draft resolution seeks to subvert the will of San Juan County citizens in relation to the massive “Bears Ears National Monument” designation, which President Obama made in December of 2017, just days before leaving office. The majority of Utahans opposed the monument, and an even larger percentage of SJC citizens fought against the proposed designation beginning in 2015. Following Obama’s pronouncement finalizing the creation of the monument, state and local leaders, including Democrat County Commissioner, Rebecca Benally, who is Navajo, took their fight against the 1.4 million acre monument all the way to Washington D.C.. With effective lobbying and compelling stories about how previously-designated monuments have proved economically devastating to southern Utah’s small communities, Interior Secretary Ryan Zinke and President Trump listened, and in December of 2017, Trump reconfigured the “Bears Ears” and created two new, much smaller monuments more than sufficient to meet the requirements of the Antiquities Act. Calling President Trump’s use of the Antiquities Act to shrink the Obama monument “unlawful,” the resolution below is a slap in the face to the majority of SJC citizens, and a gift to the radical environmentalist groups, including Dine’ Bikeyah, Southern Utah Wilderness Alliance, and Friends of Cedar Mesa, which have been at war with local economic interests for years. Due to either ignorance of the law, or a sheer contempt for local sentiments regarding the now-defunct Bears Ears monument, this resolution claims that President Trump “violated” the Antiquities Act, when in fact the Antiquities Act is completely subject to the actions of the sitting president. RESOLUTION RESCINDING ALL PRIOR RESOLUTIONS OF THE SAN JUAN COUNTY COMMISSION OPPOSING THE ESTABLISHMENT OF THE BEARS EARS NATIONAL MONUMENT OR CALLING FOR THE DIS-ESTABLISHMENT OR REDUCTION OF THE BEARS EARS NATIONAL MONUMENT, SPECIFICALLY RESCINDING RESOLUTIONS NOS. 2015-09 (A RESOLUTION OF THE BOARD OF COUNTY COMMISSIONERS OF SAN JUAN COUNTY, UTAH, SUPPORTING LOCALLY-DRIVEN LAND MANAGEMENT PLANNING AND OPPOSING PRESIDENTIAL DESIGNATION OF A NATIONAL MONUMENT(S) THROUGH AUTHORITY OF THE ANTIQUITIES ACT OF 1906), 2016- 08 (DEFICIENCIES OF A PROPOSAL OF A NON-GOVERNMENTAL ORGANIZATION FOR ESTABLISHMENT OF A NATIONAL MONUMENT IN SAN JUAN COUNTY; NOTIFICATION OF COUNTY PREROGATIVES AND INTENT FOR LAND USE PLANNING), AND 2017-02 (RESOLUTION REQUESTING AND RECOMMENDING THE REVERSAL OF THE DESIGNATION OF THE BEARS EARS AREA AS A NATIONAL MONUMENT),CONDEMNING THE ACTIONS OF PRESIDENT DONALD TRUMP IN VIOLATING THE ANTIQUITIES ACT OF 1906 BY UNLAWFULLY REDUCING THE BEARS EARS NATIONAL MONUMENT THROUGH THE PROCLAMATION OF DECEMBER 4, 2017 (NO. 9681) AND CALLING UPON THE UNITED STATES TO FULLY RESTORE THE BEARS EARS NATIONAL MONUMENT. WHEREAS, for hundreds of generations native peoples have lived in the canyons and mountains and on the mesas that were included in the original Bears Ears National Monument, and as a result the area is one of the most significant cultural landscapes in the United States. WHEREAS, records of generations of native habitation that tell the story of the subsistence of daily life, traditions, and ceremonies are contained in the rock art, cliff dwellings and other structures, and ceremonial sites within the original Bears Ears National Monument. WHEREAS, historic remnants of Navajo hogans, pottery, sweat lodges, sheep-herding camps and farming are found throughout the area contained in the original Bears Ears National Monument. WHEREAS, the cultural importance of the lands and resources in the original Bears Ears National Monument are sacred to many native peoples, including Navajo, Ute, Hopi and Zuni tribes. WHEREAS, protecting the lands and resources contained in the original Bears Ears National Monument will help protect and preserve the cultural, prehistoric, historic records and legacy of native peoples, and the cultural traditions and practices that continue through today. WHEREAS, on September 1, 2015, the San Juan County Commission approved Resolution No. 2015-09, A Resolution of the Board of County Commissioners of San Juan County, Utah, Supporting Locally-Driven land Management Planning and Opposlng Presidential Designation of a National Monument(s) Through Authority of the Antiquities Act of 1906 The Commission failed to adequately consult with Indian tribes or citizens of the County who are members of Indian tribes before approving this resolution. WHEREAS, on October 4, 2016, the San Juan County Commission approved Resolution No. 2016-08, Deficiencies of a Proposal of a Non-Governmental Organization for Establishment of a National Monument). The Commission failed to adequately consult with Indian tribes or citizens of the County who are members of Indian tribes before approving this resolution. WHEREAS, on December 28, 2016, President Barack Obama issued Proclamation No. 9558, establishing the Bears Ears National Monument. WHEREAS, on March 8, 2017, the San Juan County Commission approved Resolution No. 2017- 02, Resolution Requesting and Recommending the Reversal of the Designation of the Bears Ears Area as a National Monument. The Commission failed to adequately consult with Indian tribes or citizens of the County who are members of Indian tribes before approving this resolution. WHEREAS, on December 4, 2017, President Dona Id Trump issued Proclamation No. 9681, effectively dis-establishing and reducing the Bears Ears National Monument, in violation of the Antiquities Act of 1906. WHEREAS, none of the seven Navajo Nation local governments with lands located withln Utah (the Navajo Mountain; Oljato; Mexican Water; Red Mesa; Dennehotso; Aneth and Teec Nos Pas chapters) supported the opposition of the San Juan County Commission to the designation of the Bears Ears National Monument. WHEREAS, by Resolution NABIAP-35-17, the NavaJO Nation opposed the initiative of the State of Utah and others to rescind the designation of the Bea rs Ea rs NationaI Monument and by Resolution NABUA-01-17 reaffirmed its support for the designation of the Bears Ears National Monument. WHEREAS, the decision by President Donald Trump to dis-establish the Bears Ears National Monument was taken without adequate consultation with Indian tribes and in blatant disregard of tribal interests. WHEREAS, similarly, the recommendations of the San Juan County Commission to oppose the Bears Ears National Monument and to dis-establish the Monument were made without adequate consultation with Indian tribes by the Commlssion and were done in blatant disregard of tribal interests. Section 1: All prior resolutions or official actions of the San Juan County Commission opposing the Bears Ears National Monument or calling for its dis-establishment or reduction, and specifically Resolution Nos. 2015-09, 2016-08 and 2017-02, are hereby immediately rescinded. Section 3: The San Juan County Commission cal!s upon President Trump to immediately withdraw Proclamation No. 9681 and for the United States to fully restore the Bears Ears National Monument as originally designated in Proclamation No 9558. Section 4: The San Juan County Commission directs the County Administrator to immediately transmit this Resolution to the Secretary of the Department of the Interior and other interested governmental agencies . The final draft resolution appears to have been written by one of the radical environmentalist groups mentioned previously. Also related to the “Bears Ears” controversy, the resolution seeks to undo previous SJC Commission actions which supported the Trump Administration’s actions. Most revealing of all is the naming of specific parties in the resolution below, including Donald Trump, Mountain States Legal Foundation, and William Perry Pendley, all of whom are generally despised by environmentalist NGOs. Pendley, who is representing the County in the case mentioned in the resolution, is one of the most respected and effective property rights defense lawyers in the country. INC., et al., v. DONALD TRUMP, et al., CASE NO. 17-CV-2606 (TSC) AND TO FURTHER IMMEDIATELY TERMINATE ANY AND ALL REPRESENTATION AGREEMENTS BETWEEN SAN JUAN COUNTY AND THE MOUNTAIN STATES LEGAL FOUNDATION. WHEREAS, San Juan County has filed various pleadings in three cases filed in the United States District Court for the District of Columbia, These cases are as follows: HOPI TRIBE, et al v.
DONALD TRUMP, et al,, CASE NO. 1-l 7-CV-2590; UTAH DINE BIKEYAH, et al. v. DONALD TRUMP, et al., CASE NO. 1:17-CV-2605 (TSC); and NATURAL RESOURCES DEFENSE COUNCIL, INC., et al., DONALD TRUMP, et al., CASE N0. 17-CV-2606 (TSC) (referred to below as “the Cases”). WHEREAS, the pleadings filed by the County include an Answer to the complaint filed in each case (Dkt. Nos _ 25-1; 25-2; and 25-3), a Declaration of Kendall Laws (Dkt. No. 25-5) stating that the County has authorized intervention in these cases on behalf of the Defendants, a Defendant-Intervenor’s Motion to Intervene (Dkt. No. 25) and San Juan County’s Reply in Support of Motion to Intervene (0kt. No. 70}. WHEREAS, the County is represented in these cases by the Mountain States legal Foundation and William Perry Pendley. WHEREAS, the San Juan County Commission has reconsidered its position regarding the Bears Ears National Monument and no longer supports the unlawful reduction of the Monument by President Donald Trump. WHEREAS, in light of its changed position concerning the Monument, the County will withdraw its prior authorization for intervention in the Cases. WHEREAS, the San Juan County Attorney, Kendall Laws, is required to implement the directives of his client, San Juan County, as those directives are expressed in official actions of the County Commission. See, Salt Lake County Commission v. Salt Lake County Attorney, 985 P.2d 899, 905 (1999); UCA § 17-18a-802; Rules 1.2 and 1.13, Utah Rules of Professional Conduct. WHEREAS, in light of the County’s withdrawal from the Cases, the County will no longer require the services of Mountain States Legal Foundation and William Perry Pendley and the County, through this official action, will also exercise its authority to direct the County Attorney to immediately terminate the representation agreement between the County and Mountain States Legal Foundation and William Perry Pendley. Section 1: The San Juan County Commission has reconsidered its position regarding the Bears Ears National Monument and no longer supports the unlawful reduction of that Monument by President Donald Trump. Section 2: In light of its changed position concerning the Monument, the County hereby immediately withdraws its prior authorization for intervention in the Cases, as that authorization was expressed to the United States District Court for the District of Columbia in the Declaration of Kendall Laws (Dkt. No. 25-5). Section 3; The County Attorney is directed to immediately file a motion, or to instruct Mountain States Legal Foundation and William Perry Pendley to file such a motion, withdrawing all pleadings filed by the County in the Cases and to specifically withdraw the County’s motion to intervene in the Cases on behalf of the Defendants. These resolutions, although in the draft stage, should be very troubling to the citizens of San Juan County. Through a politically-driven gerrymandering lawsuit, the majority of the county no longer has representation, and power has been concentrated in a small geographical region dominated by left-wing politics and radical environmental activism. Maryboy and Grayeyes, however, are immune from the consequences of whatever actions they take at the county level, since they are both members of the Navajo Nation. Their ties to environmental groups who strongly supported Obama’s Bears Ears designation, may explain their willingness to subvert the will of the majority of San Juan County citizens. *One draft resolution included in those obtained by Free Range Report, which is not included in this post, deals with more typical county business, and is related to the creation of a waste transfer station in Bluff, Utah.